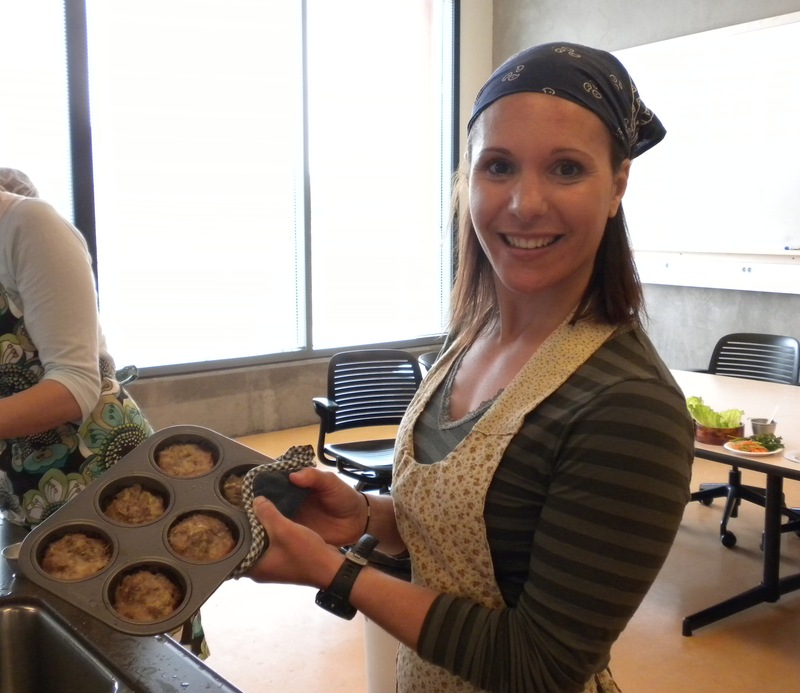 I was lucky enough to partake in the UC Davis Food Science Food Olympics. Think foodies and science geeks all crowded together in a giant cooking kitchen and lecture battling it out to be the next Food Olympics champion. We had our hands on so many wonderful ingredients, and the cooking portion (only 1/3 of the event) was like being a kid in a candy store. Part of the cooking event is incorporating ‘secret’ ingredients into your meal. Ours included lavender, matzo, celery root and a few others. You have 15 minutes to come up with the menu and 1.5 hrs to cook 3 courses. I’m bragging here, but the meat dish, which I headed up, got a perfect score. Yeah! Meanwhile mix 1/3 lb lamb + 1/3 lb turkey (wanted to use all lamb, but there was only 1/3 lb left) . Mix in one egg. Add the meat to the sautee’d shallots/spices and mix. Mix in about 1/4 lb of really strong blue cheese. The stinkier the better! Cook until meat is just under done. Place equal amounts into greased muffin tins and bake at 375 for about 10 min, DON”T OVER COOK! While that is cooking, whip up some brown basmati rice, adding 1/4 cup of raisins, some bay leaf, and a touch of rosemary to the broth. Serve the mini-muffins over rice and garnish with shredded veggies or a side salad.